OTP is clearly all about the boys that play football as amateurs. That’s one of the reasons why we don’t cover Auburn. HEY-O! Seriously though, when it comes to the pros, I’m a casual fan at best. Part of that casualness manifests itself in rooting for the Bears and Colts. One team each from the AFC and NFC, both teams fairly local to my Indiana home. After the Colts were bounced last Saturday from the playoffs, my lone rooting interests have now shifted to the Bears. The Monsters of Midway face the Seattle Seahawks this Sunday, so clearly Seattle and their sub-.500 record became enemy number one. Leave it to the Seahawks to make me rethink that strategy. 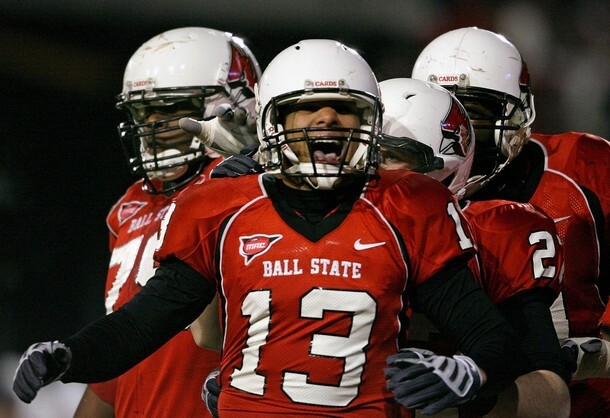 Today it was announced that Seattle is expected to sign former BSU QB Nate Davis. What role Davis will play and what his contribution to the Seahawks will be remains unclear, but here’s hoping Nate at least gets a shot. His time with the 49ers was rocky at best and he ended the season on the 49ers practice squad. Seattle’s current QB roster includes Matt Hasselbeck, Charlie Whitehurst, and J.P. Losman so Nate certainly won’t be buried on the chart behind a firmly entrenched incumbent. Of course, the same could be said about the 49ers who let Nate toil away behind the talent rich Alex Smith, Troy Smith, and David Carr. Yes, that’s sarcasm. So congrats to Nate for being picked up by the Seahawks. In the past week, the Seahawks defended their field on Wild Card Weekend, beat the Saints, thus stopping anymore sob stories about Katrina and a city on the mend, and signed the premier BSU contribution to the NFL. After Sunday’s game I might just have to start rooting for them too. Casually, of course.